An angler nets a large trout during the “Rumble in the Rhododendron” fly fishing tournament held in late October. With $10,000 in prize money, the event was one of two major fishing competitions held in Cherokee’s tribal waters last year. The largest event was the U.S. National Fly Fishing Championship held in Cherokee last May — the first time the National event had been held in the Southeast. This year, the Eastern Band of Cherokee Indians Fish and Wildlife Management division and the Cherokee Chamber of Commerce have scheduled a total of eight major fishing events, beginning with the Shiver in the River Fly Fishing Tournament on Feb 3, 4 and 5. Held on the 2.2 miles of trophy, catch-and-release water on the Cherokee Reservation, the tournament has a $225 entry fee with $10,000 in prize money. Click for more information about all eight Cherokee fishing tournaments. Each year, the EBCI Fish and Wildlife Management division stocks nearly 400,000 trout in the tribal waters, a stream system connecting 30 miles of freestone streams that include secluded forest settings, suburban road side areas as well as the center of the town of Cherokee. 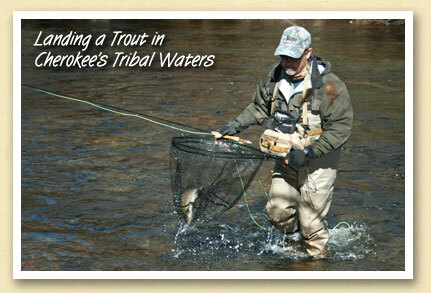 Fishing in most of the Cherokee tribal streams requires a $10/day tribal permit for each person 12 years of age and over. No other fishing permit or license is accepted. Fishing in the “Trophy Waters” catch-and-release section of Ravens Fork requires an additional special use permit. Details, including information on multi-day and special use permits, can be found here. For more information on fishing in the Smokies, including area fishing guides and outfitters, visit the fishing page at GreatSmokies.com.